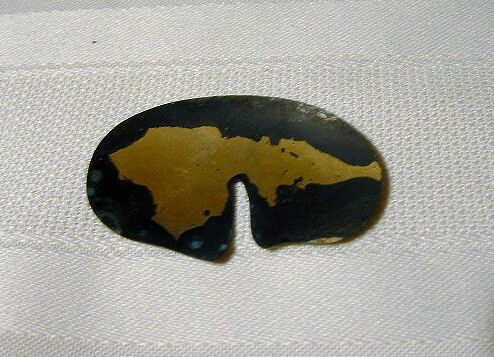 I have been experimenting with patinas on metal. You can buy patina chemicals, but you can also use things from around the house, like salt, rust, and ammonia. My feline companion Plumpton and I sometimes collaborate on artistic projects. 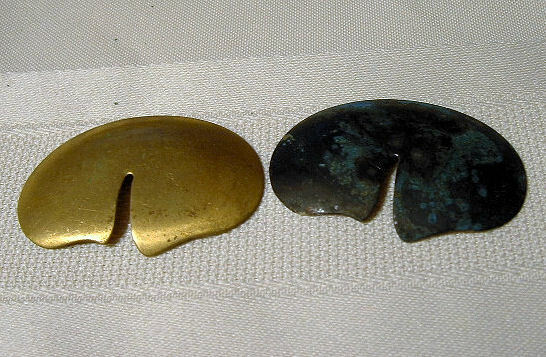 Here are two examples of copper buried in Plumpton’s litterbox. Why buy iron oxide when it grows wild everywhere? Yes, iron oxide is another name for rust. Take a rusty object and put in into a plastic bag with a few drops of water and the metal object you want to have a rust patina. Here is a what a steel washer looks like, before and after. The next items are salt and ammonia and the process is called fuming. 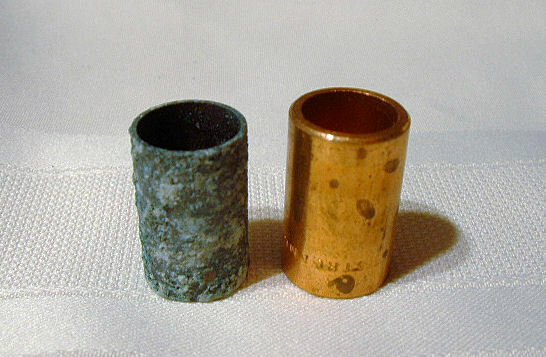 I cleaned brass and copper with a wire brush and wiped it clean with alcohol. Then I filled a small jar with white ammonia and put in inside a big jar. 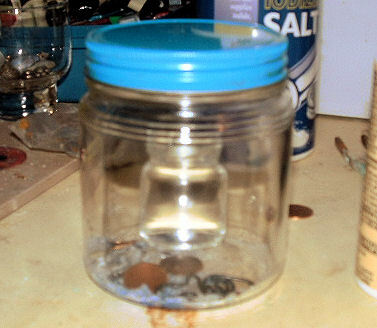 I sprinkled salt in the big jar (not in the ammonia), put in the metal, and screwed on the lid. At first, the brass started turning black from the edges and I didn’t think anything interesting was going to happen. Then I got this. Kewl! 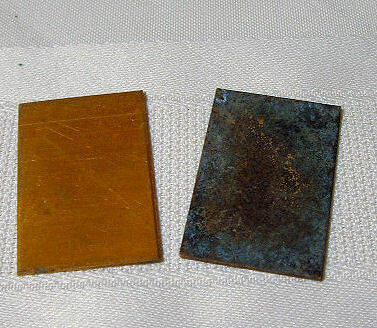 Here is the same process repeated on copper. More experiments to follow . 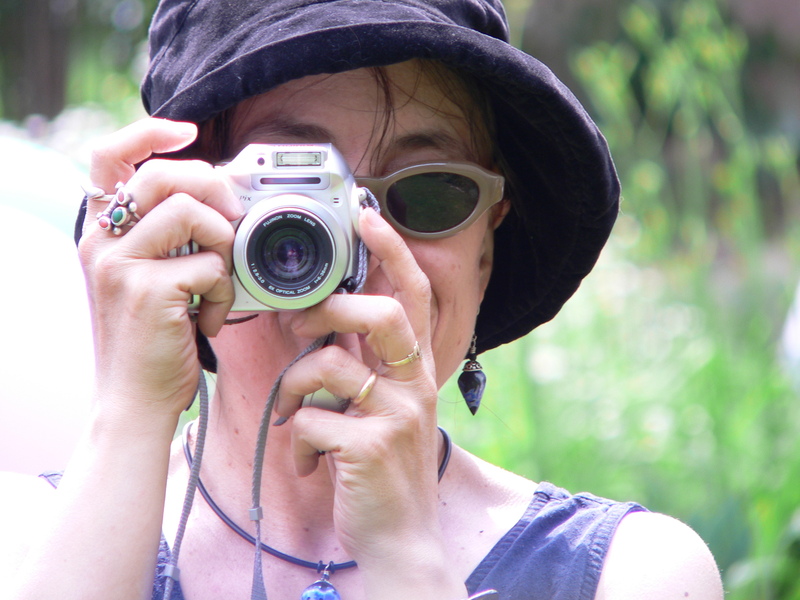 . .
A final note – I took “Forming Lasting and Meaningful Attachments” with Robert Dancik last weekend with the Philadelphia Area Polymer Clay Guild last week. The class covers cold connections and is one of the best classes I ever took. I didn’t make a thing, but I don’t care. I learned so much it will take time to process it all. Take this class if you have the chance. what an amazingly helpful blog! i just googled ‘alexander calder exhibitions’ and some how ended up at your page, let me say i am so glad i did. i made an account here so i could comment you! last summer i got really into jewelry making, using various wire, beads, found objects or basically, whatever i think works and recently epoxy resin and casting. make no mistake though, im a total beginner. i’ve been so interested to work w/ patina but i dont know where to begin! im really having trouble teaching myself. i bearly know if its one thing or many! everyone at the craft stores by me are completely clueless, they dont even know what im talking about. over the past few months, here and there, i have jumped from site to site trying to learn and w/ little luck. so you can imagine how excited i was to read this… and finding it randomly, totally by accident your blog was so incredibly helpful. you explained things so clearly, to the point and easy to understand. i can tell you know your stuff, i mean, what the hell is liver of sulfur!? i know what these things DO, just not exactly what they are or how to find them. i wanted to say thank you so much for sharing your information. i definitely plan on checking out more of your blogs and hopefully be enlightened further. feel free to share ANY additional knowledge you think i might be interested in! wow, this is really long! thanks again!! Thanks. Check out this article by Charles Lewton-Brain on the Ganoksin web site for information on liver of sulfur. You may want to try Miracle Grow for a green patina. Just add a little water to the crystals and paint on a clean scratched surface. The high acid works best.